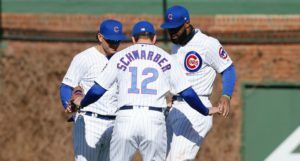 Tonight, without any help from the Brewers or anybody, the Cubs can drop their magic number down to 10. But if they manage to win and the Reds figure out a way to beat Milwaukee, we can be looking at a single-digit magic number when we wake up tomorrow morning. I say “wake up tomorrow morning” instead of “before we go to bed tonight,” because I’m guessing some of you will drop out before the end of this one. The Cubs don’t start until 8:40 CT, which means we’re talking about an 11:40-midnight finish. But for those of you joining us all night, buckle up. It could be a tough one. As we discussed earlier today, Patrick Corbin has been on an absolute tear lately – since the second half, really – and will be pitching at home tonight. We also are left wondering the age old question of who wins the split game when right-handed hitters like to face lefties, but the left-handed pitcher has reverse splits? It’s like the chicken and the egg (not really). At the same time, the Cubs have a relatively hot Kyle Hendricks going for them tonight, and he’s been nearly as good as anybody in the Cubs rotation lately. 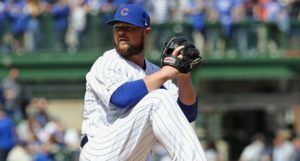 With a little luck – and a really good changeup – he can help the Cubs inch closer to that finish line tonight. 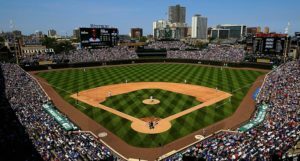 Even though we have a Chicago Bears site – Bleacher Nation Bears – and there’ll be a game going on simultaneously, remember this is a big one for the Cubs. Stay focused.